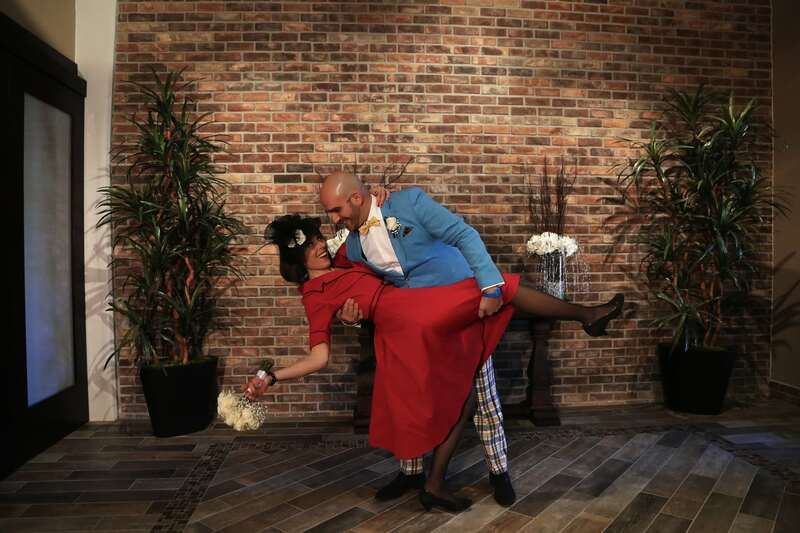 Located in the heart of the downtown Las Vegas Arts District is our beautiful alternative to a cheesy chapel wedding! We are also just a few blocks from the Las Vegas Marriage License Bureau and the Fremont Street Experience. 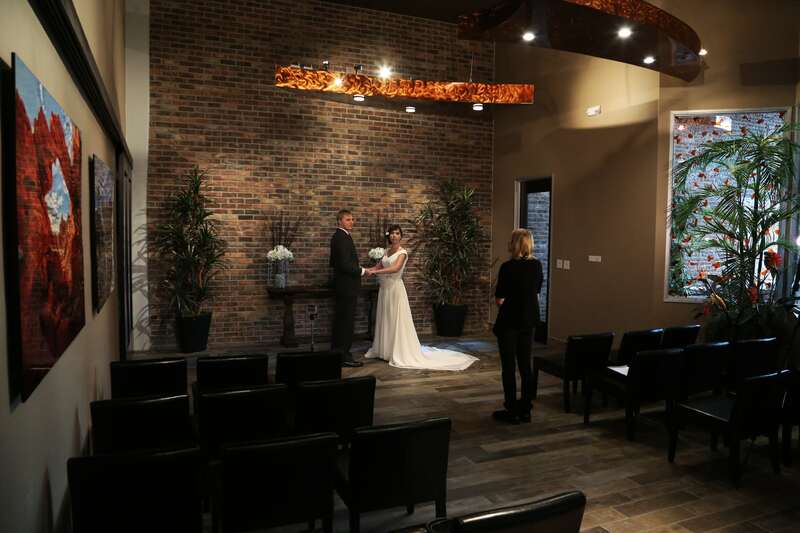 Adjacent to our office is the incredible Scenic Las Vegas Weddings Chapel. 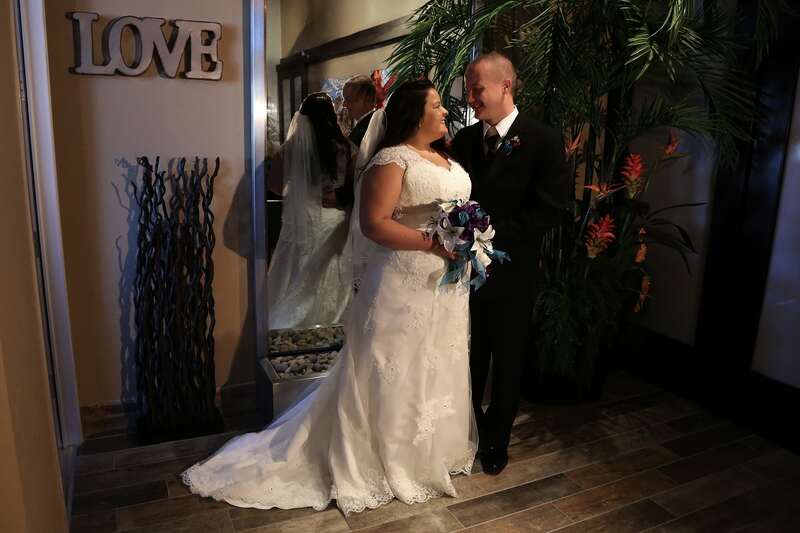 Imagine your Las Vegas wedding in our beautiful wedding chapel. 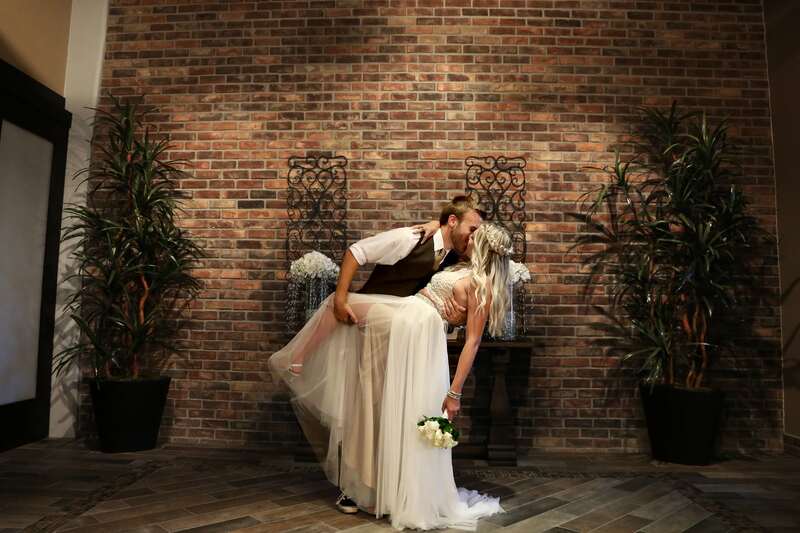 Our Wedding Chapel can seat up to 25 guests comfortably on black leather chairs and is decorated with a 30-foot tall brick wall and beautiful rustic decor. 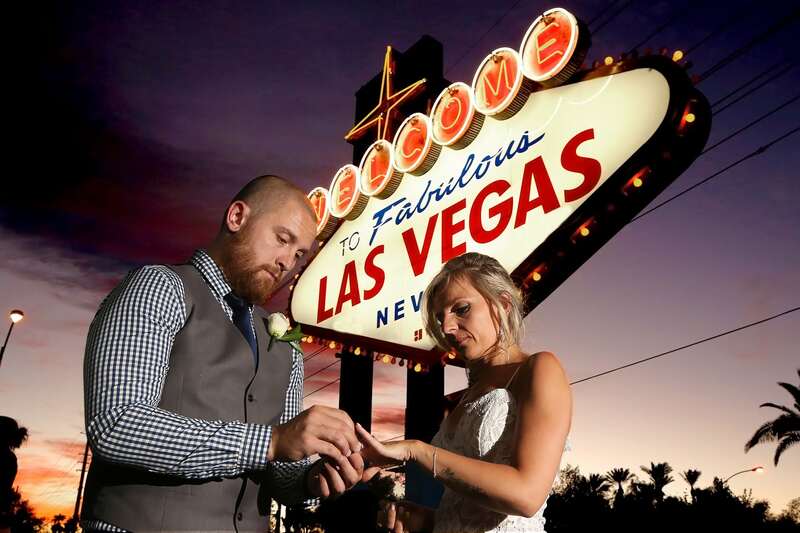 Our Scenic Las Vegas Weddings Chapel is definitely not your typical cheesy Las Vegas Wedding Chapel! The surrounding area also offers great photo opportunities of the neon lights of Fremont Street, cool mural graffiti art, and the imposing Stratosphere Tower as a back drop. 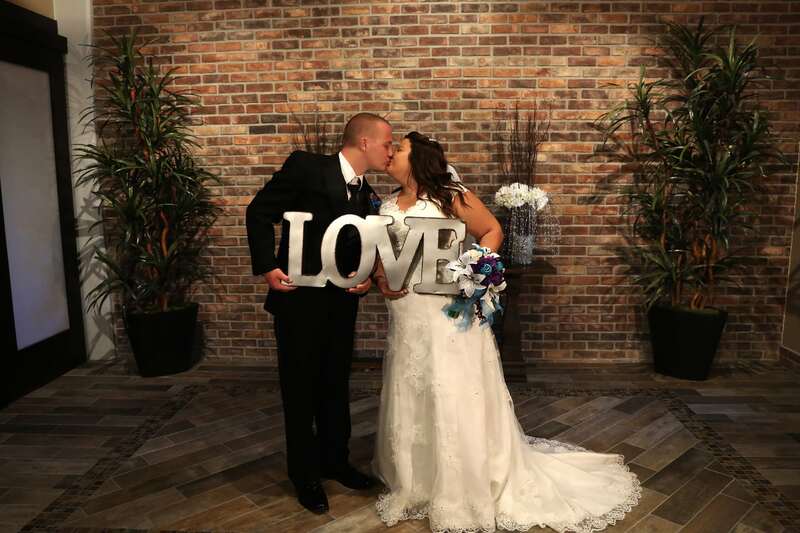 Reserve your Las Vegas Wedding Chapel Package with us today! 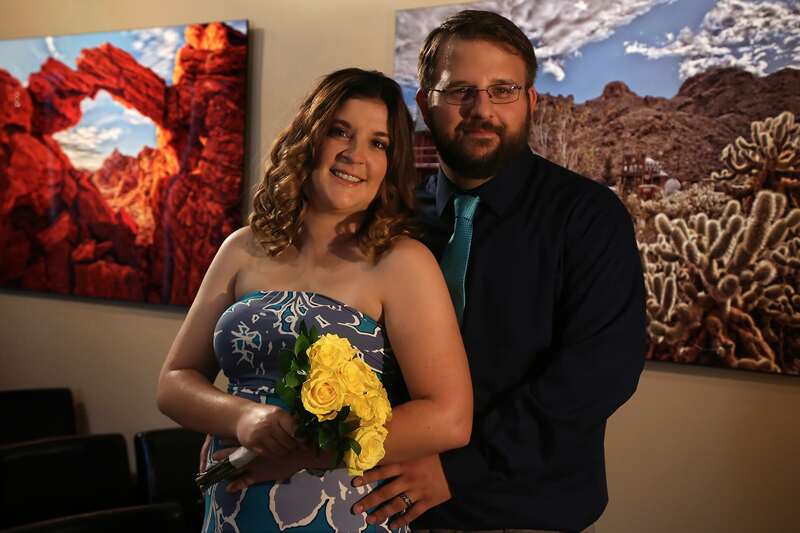 The Scenic Las Vegas Weddings Chapel can also be used as your ceremony location for any of our Las Vegas Strip Wedding packages! Can we have our photos on the Vegas Strip? The video will be during the ceremony only and of the couple only. The camera is placed next to the Minister on a tripod to get the best sound and video. You will receive your video in an MP4 video format on your photo USB drive. 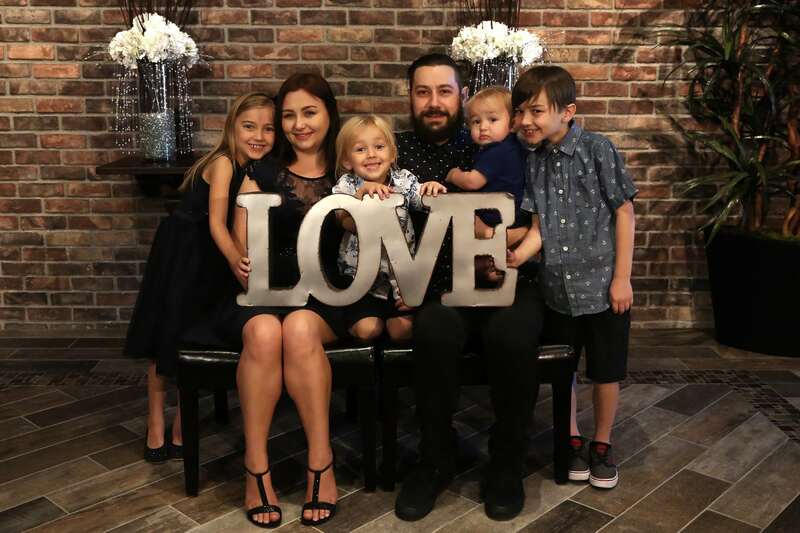 In addition to your HD Video we will upload your video to Vimeo and a link will be emailed to you of your wedding ceremony to share with your family and friends. 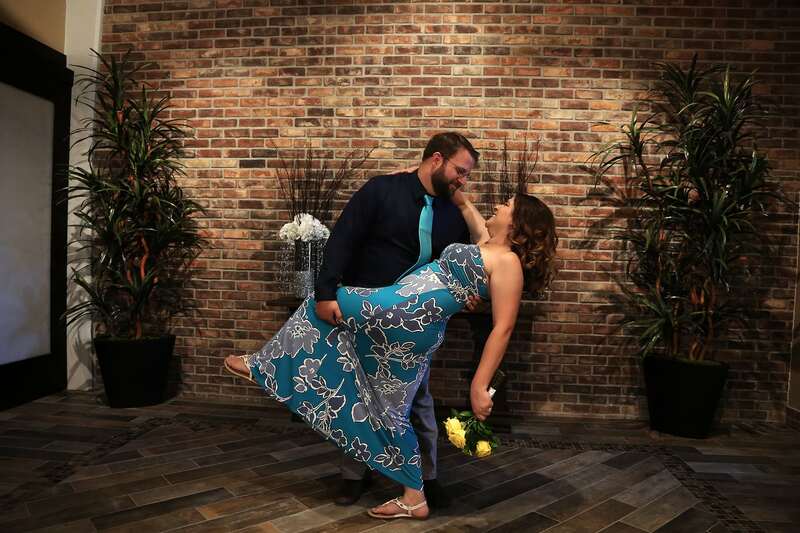 If you would prefer for your guest or guests to record your wedding, there is a $50 fee. If you have paid for us to record your wedding ceremony, your guest or guests may also record your ceremony at no additional charge. An all-inclusive package includes a 12-rose bridal bouquet and a matching single rose boutonnière. For basic packages or for additional flowers for an all-inclusive package, we are happy to provide a referral to a Las Vegas florist. You are also more than welcome to bring your own flowers at no additional charge. Do you have a professional hair/make-up recommendation? We will give the salon contact information to you. The salon will send a hair stylist and make-up artist to your hotel room or Las Vegas address. Can I have additional guests? 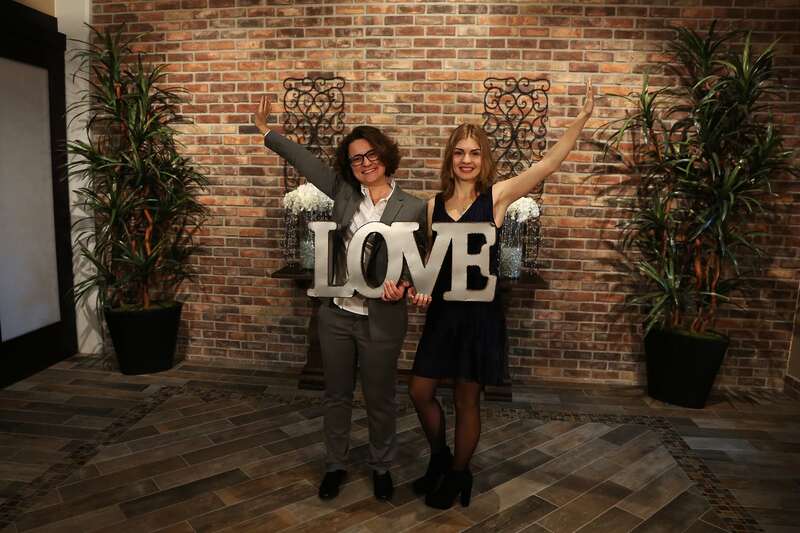 What about our Marriage Certificate? Expedited filing of the marriage certificate – your marriage certificate will be filed with our Clerk’s office the next business day after your wedding and will be available for purchase ($15) at the Marriage License Bureau self-service kiosk after 5 PM the next business day after your wedding. One certified marriage certificate + apostille – do not select this option if you live in the USA, Canada, UK, Australia, and many others. ONLY select this option if you are registering your marriage in a foreign country that requires an apostille with your marriage certificate. What about transportation to our wedding? 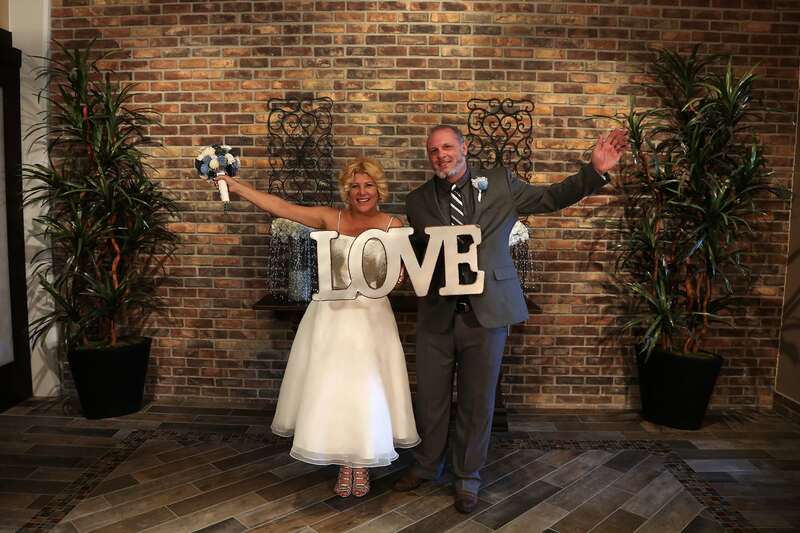 All of our scenic wedding (including our wedding chapel) and photography packages include courtesy limousine transportation for a MAX of 10 persons (must include the bride and/or groom), so you can enjoy a relaxing and stress-free day. You are also more than welcome to arrange your own, additional transportation. You can decline our courtesy transportation, if you prefer to drive yourselves or to arrange other transportation. You can confirm or deny our transportation on our reservation page. 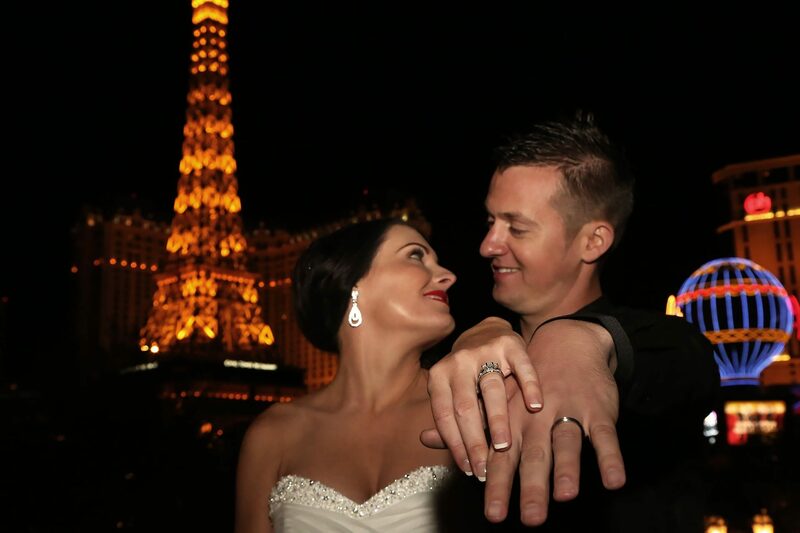 We do not offer transportation for any of our Las Vegas Strip wedding or photography packages. If you would like limousine transportation for Strip packages, you can contact Presidential Limousine, Bell Transportation, or Earth Limousines (or any provider you like). For the Las Vegas Strip, you can also Uber or Lyft to locations, if you prefer. Photography during the wedding ceremony, group shots, and posed pictures of the wedding couple. You will receive a minimum of 50 high resolution JPEG photos on a USB flash drive. You will receive ALL photos with ALL non-commercial photo rights belonging to you for all your printing and social media sharing needs. We shoot as many photos as possible during your time and with the couple and guests cooperation you can get a significantly higher number of photos in that time period. The maximum number of guests (not including the wedding couple), is a strict 25 guests. Any optional additions to your wedding package must be booked and paid for a minimum of 2 weeks prior to your wedding. 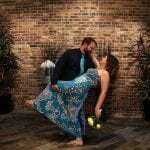 There is not an option for outside photographers or Wedding Officiants. 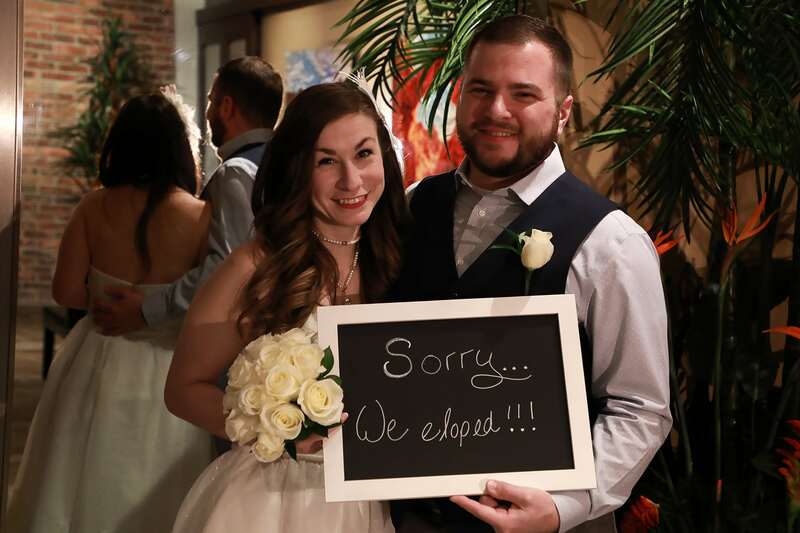 Marriage license (purchased at the Marriage License Bureau in Las Vegas by the wedding couple)/certified copies of marriage certificate (purchased online at the Clark County Clerk’s Office by the wedding couple 10 days after your wedding). Gratuities for the photographer, Wedding Officiant, and limo driver(s) (suggested amount is $50 and up per person). 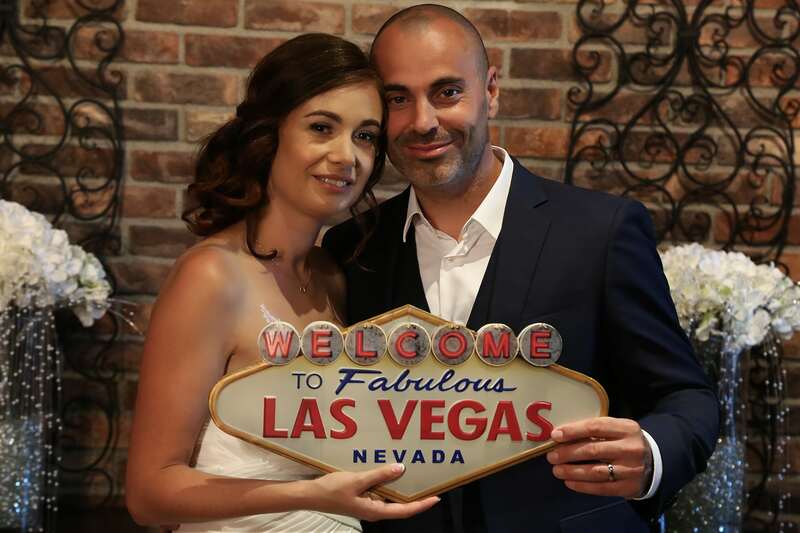 © 2019 Scenic Las Vegas Weddings. All Rights Reserved.